Who knew so much nutrition could be packed into a tiny whole grain like millet? Millet is a generic name assigned to thousands of small-seeded annual grasses belonging to different species that have been grown in various parts of the world dating back thousands of years. Millet can grow in harsher (drier and cooler) conditions than many staple crops. Its presence as a staple crop can be found in numerous archeological records, starting in Asia and Africa and then spreading to almost every part of the world. Toasting millet before cooking improves its texture and gives a nutty flavor. Simply preheat a skillet over medium heat, then dry toast the millet (i.e., stir frequently with no oil added) for a few minutes until the seeds turn golden brown and give a pleasant nutty aroma. Cooking Time: Combine toasted millet with water in a covered pot, bring to a boil, then turn down the heat and simmer on low for about 20 to 30 minutes. (In our case, pre-toasting millet took 7 minutes and the millet cooked in 18 to 20 minutes). 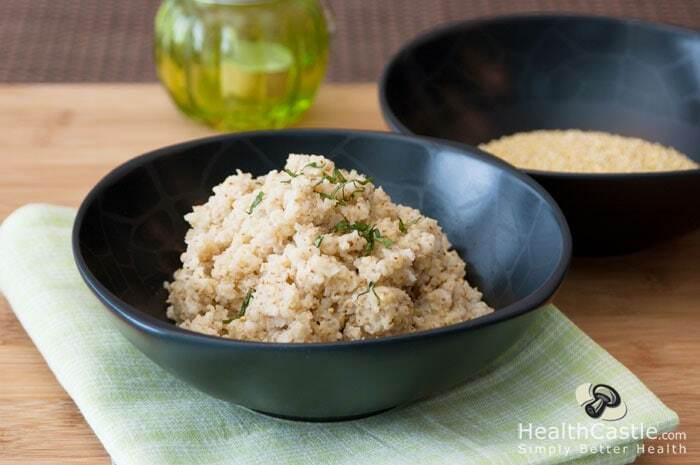 Millet prepared this way will have a nice, fluffy texture similar to rice. If you prefer a creamy, porridge-like consistency, stir occasionally during cooking, adding a bit of water each time. Try it in place of oatmeal for a hot, hearty breakfast. Use millet in baked goods, such as these Millet Muffins. Make casserole, such as this Autumn Millet Bake. Serve Millet Cakes for snack or as a side dish.